Did you know that March 20th is World Oral Health Day? This year, the theme for World Oral Health day is “Live Mouth Smart”. To celebrate the day, Aspendale Gardens Dental Care is holding a competition where we want to see how you manage to Live Mouth Smart. 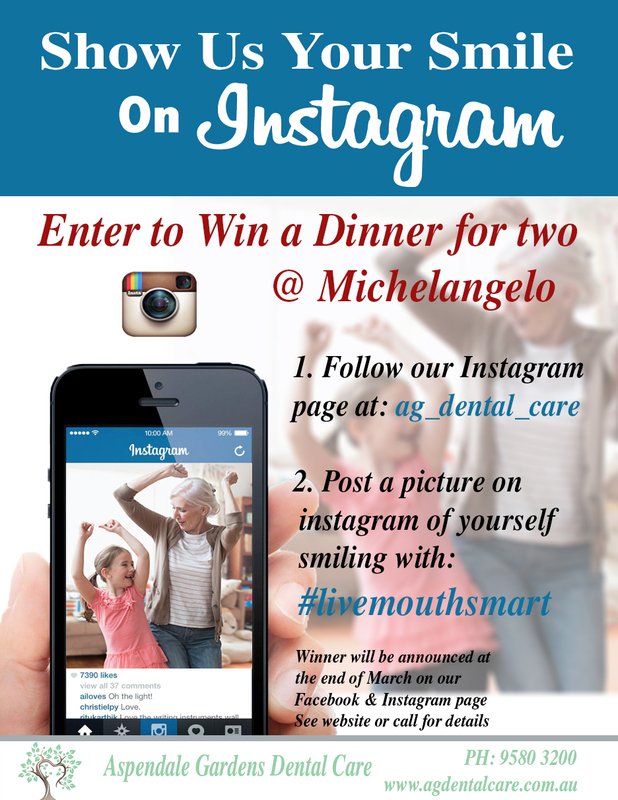 To enter, simply follow us on Instagram at ag-dental-care and post a picture of yourself showing us your beautiful smiles on Instagram with the hashtag #livemouthsmart. You will go into the draw to win a dinner for two at Michaleangelo’s and the winner will be announced on both our Facebook and Instagram page at the end of the month. 3. Go to your dentist for regular check ups to keep your teeth in check and healthy.